Spring is in the air, and with it, FMD Architects is kicking off a new blog series focusing on Brewery Expansion. We will be concentrating on a different element of brewery expansion and providing a behind-the-scenes Architect’s and Brewer’s perspective into the planning process. As the first post in the series, and just in time for the weather to warm up, we will be diving into planning considerations for outdoor areas and beer gardens to kick-off your 2019 planning and help you avoid common mistakes. If you do not already have outdoor areas defined with your liquor license, this will be one of the first steps your brewery will need to take in the planning process. You will need to file documents with the State and Federal liquor control agencies, and this can add time to your overall schedule as the agencies will need to review and approve these items. The exact requirements and enforcement will vary from jurisdiction to jurisdiction, but in most cases, one of the primary design requirements of defining your permit premises is to provide a physical boundary around your outdoor area to designate where alcohol is and is not allowed. During the planning stages, you have the opportunity to rapidly test different ideas and get creative with what and how this boundary can function for you. For example, instead of a simple fence, you can have your design team develop a decorative drink rail around the perimeter, use dense landscaping as the boundary, or a combination of both options to create a designated outdoor area that is functional and beautiful. Outdoor patio and beer garden spaces are classified similarly to your tasting room, and are governed by certain code requirements that must be met for access and egress (exiting). As an assembly space, careful attention must be given to how occupants enter and exit the outdoor areas as well as the total number of people utilizing or “occupying” the space. If the patio is only accessed by passing through your building for example, you will need to accommodate that many extra people in your building, and your exits will have to be based on the sum of the building occupant load plus the outdoor areas. If this consideration is not accounted for up front, it can create a delay in the permitting and construction process as drawings and designs will need to be revised and resubmitted in order to be code compliant. When we design outdoor areas, we often approach the design in a way that allows the patio to provide multiple functions for your brewery. 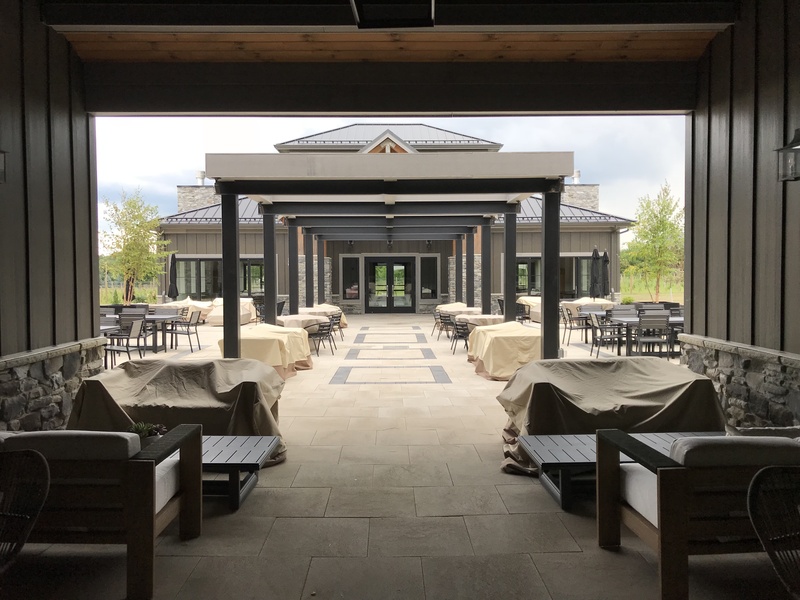 While a simple slab, pavers, or even grassy area provide the basic needs as space for seating, we will often recommend building a covered area or pavilion as well. Not only does this create a different seating environment for customers to enjoy, but by taking in account certain design considerations, a covered area can very easily become a performance area for live music, extend the seasonal use of your outdoor space, or even become a source of additional income as a rentable event area. 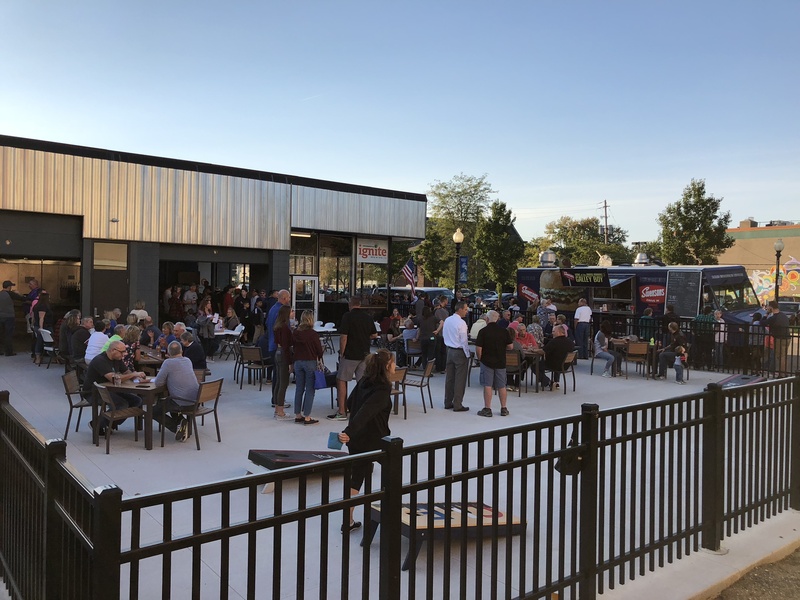 Outdoor areas are a great way to bring in extra people, and are often stocked with games like corn hole and bocce ball, but as a brewery, unless you are charging customers to play, don’t let those overshadow your main business of making and selling beer. Talking with different owners throughout the years, we often here reoccurring comments about groups that plays corn hole for hours but only buy a few beers and no food. When asked about how their space is set up, we typically find that the main bar and outdoor areas are very disconnected, and either the staff couldn’t keep track of customers’ needs or the walk to the bar took too long. 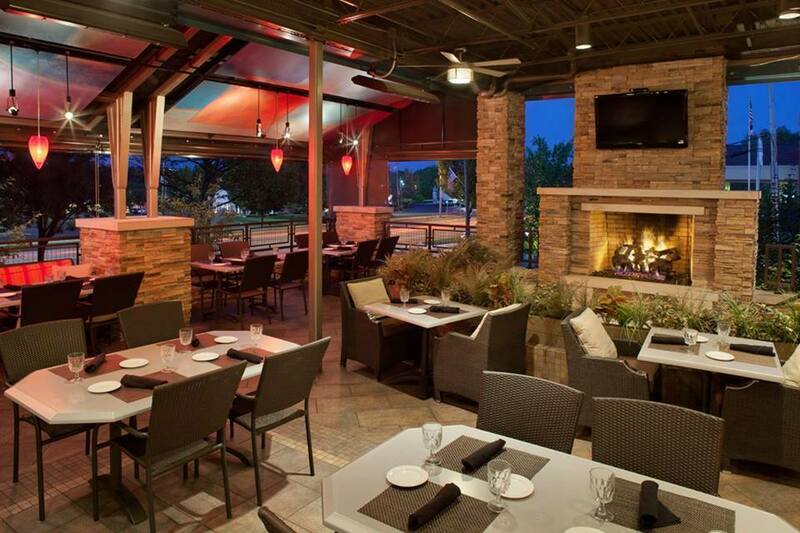 For those that are not planning to have a dedicated outdoor bar, when designing outdoor areas, consider providing windows or oversized doors to help tie the spaces together and let your staff keep an eye on the activity in and outdoors. Placement of the outdoor activities is a key consideration, especially for features that are not easily moved like bocce courts, fire pits, and covered areas. Have questions about your current patio or actively in the planning stages of your own outdoor expansion? We’d love to hear from you and see how we can help.